GME Kingray’s power supplies have constantly maintained their reputation asthe highest quality and most reliable power supplies to the antenna industry.They feature posistor protection circuitry and fully comply with Australian andNew Zealand Energy Standards. Our power supplies are specifically designedto suit our full range of locally manufactured electronic products. 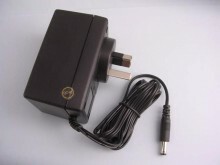 Experiencehas proven that inferior power supplies are unreliable and can damage the electronics being powered. Click the button below to add the Power Supply PSK18S 18 Vot 500 mA with DC Plug to your wish list.